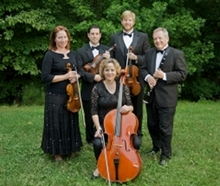 Aurora Musicalis can provide memorable music for any event. Our flexible instrumentation allows us to expand from one to four players. Some possibilities include a mixed quartet (clarinet, violin, cello, piano), string quartet (Two violins, viola and cello), trios, duos or solos. We can provide a variety of music for commemorative events, weddings or receptions. Let us help plan your special occasion! Jesu, Joy of Man's Desiring....."
Waltzes and Polkas....................Johann Strauss, Jr.